Thunbergia Laurifolia, Rang Jued. Thunbergia Laurifolia, Rang Jued is used as anti allergy and anti poisoning such as food poisoning, hangover etc; eliminates toxicity from the body. Thunbergia Laurifolia works as detoxifying agent and reduces internal heat. Q: can you describe the propiedades of the Rang Jued capsules and what is good for? A: It has been reputed to have anti-toxic effects for all kind of toxic substances. 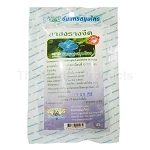 It is mainly used as a universal detoxifying agent that can help with stop smoking, alcohol detoxes. It helps Antioxidant Activity and Cytotoxicity. Also commonly used to cure a hangover. 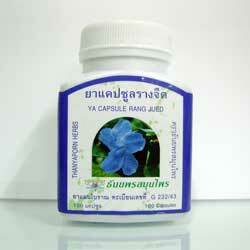 A: The total weight is 310 mg, the pure Thunbergia Laurifolia extract is 124 mg / capsule. A: all our products are manufactured and have a shelf life of 2 years, typically all shipped out products have an expiration datw of 20 - 24 months when they arrive at the customer.